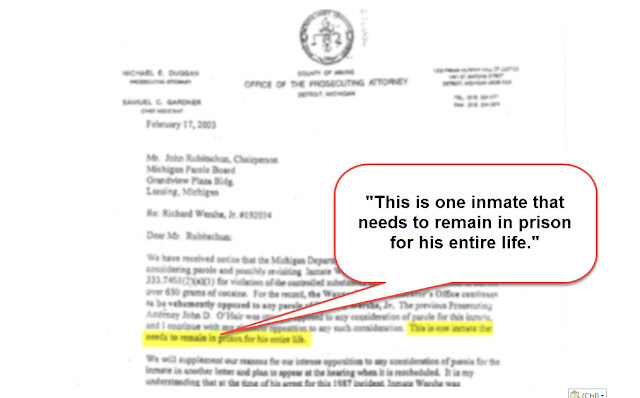 In 2003, the Michigan Parole Board considered releasing Richard J. “White Boy Rick” Wershe Jr. from prison. He had been sentenced to life for a non-violent but major drug conviction while he was a teenager. One of the most devastating arguments against Wershe’s parole came in the form of a letter from then-Wayne County Prosecutor Michael Duggan. The man who is now the Mayor of the City of Detroit claims he “doesn’t recall” the letter to the parole board but he recently sidestepped the issue in an interview with WDIV-TV reporter Kevin Dietz, saying his “office” made a recommendation in 2003 and now it’s current prosecutor Kym Worthy’s “job to decide, in 2016, what’s appropriate. Maybe so, but it’s Mike Duggan’s job to man up and own up to the misstatements and out and out lies in a letter under his name about a prisoner serving a life sentence. If he can defend that letter (he can’t), he should go for it. If not, he should do the right thing in the interest of justice. The list of people who are responsible or irresponsible in the continued imprisonment of Richard J. Wershe, Jr. is long. I would call them a Basket of Deplorables but that term has already been taken by someone else who has her own issues with what is true and what’s a lie. But I digress. Mike Duggan - Former Wayne Coiunty Prosecutor, now mayor of the City of Detroit. One of those near the top of the list is Michael Duggan, the sitting Mayor of the City of Detroit. He wrote, or his office wrote in his name, a vicious letter to the Michigan Parole Board in 2003 opposing parole for Wershe. You can read that letter here. If it didn’t have such serious ramifications the Duggan letter would be laughable in its comic book-like claims about Wershe. Nearly every alleged statement of fact in the Duggan letter about Wershe can be challenged, if not disproven outright. Here are some examples with comic book-style bold text and exclamation points. As Informant America has noted in previous posts, the Duggan letter is full of inaccuracies, unsupportable accusations and outright lies. Mike Duggan should be ashamed to have his named associated with these three pages of slander. He needs to be called out for allowing lies and distortions to be put on the record in his name. Duggan’s name carries a lot of weight in the criminal justice system because of who he was (a big city prosecutor) and who he is (a big city mayor.) 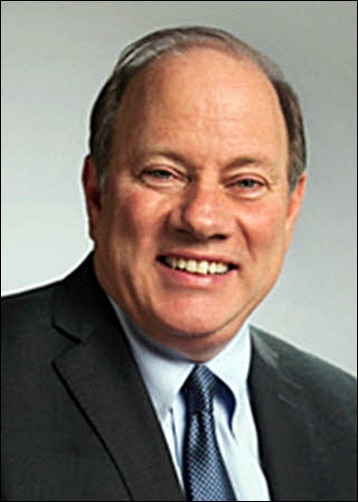 Mike Duggan needs to stand up for truth and justice. He needs to either a) publicly disavow the letter under his name to the parole board about Rick Wershe or b) call for a public hearing to air the facts, truth-and-reconciliation-style about a man who remains in prison instead of on parole partly due to the falsehoods about Rick Wershe in his letter. I can guarantee you he won’t do “b” because he can’t. There is no evidence in police files, in prosecutor files, in court files to back up most of the 2003 letter. There is nothing in the federal court records, either. In 2015 in response to a Freedom of Information Act request from me for the files and information supporting the claims in the Duggan letter, Wayne County Prosecutor Kym Worthy’s office famously denied my request, stating that after a “diligent search” they “certify” the “files do not exist.” They want Wershe to remain in prison until he dies but they didn’t bother to keep any evidence or documentation to support that position if called upon by a court to do so. The Detroit Police Department, in response to another Freedom of Information Act request, told me they had purged all of their files on Richard J. Wershe, Jr. except for a single file card that said he was convicted in Recorder’s Court on a charge of possession of cocaine over 650 grams and that he was sentenced to life in prison. A recent Freedom of Information Act request from me shows Duggan doesn’t think he has anything to worry about in terms of a besmirched reputation due to the three pages of Duggan-letter falsehoods against Rick Wershe still floating around as a prosecution exhibit in the effort to deny Wershe a parole. The City Law Department says there are no internal memos, emails or any other communications between Duggan and his administration regarding the Wershe controversy. It was and is an ugly stain on Duggan’s reputation for honesty and truthfulness but it’s not on his radar screen. In the Wershe saga the Wayne County Prosecutor has been in the spotlight. The police have been in the spotlight. The state appellate courts have been in the spotlight. The federal courts have been in the spotlight. The Michigan Parole Board has been in the spotlight. Almost everyone in this epic miscarriage of justice has been in the spotlight except Mike Duggan. It’s his turn.